Businesses such as food product manufacturers including flour mills, canneries, packers, bakers, breweries, wineries, catering for airlines, ice manufacturers and producers of pre packaged meals. Businesses such as supermarkets, convenience stores, grocers, markets/stalls and delicatessens. Take away and fast food businesses can be considered either retail or hospitality food businesses. Businesses such as restaurants, cafes, hotels, motels and caterers. Take away and fast food businesses can be considered either retail or hospitality food businesses. Businesses such as childcare centres, nursing homes, hostels, and Meals on Wheels services. Businesses such as warehouses and bulk food distribution centres. The NSW Food Authority have 3 new topics that have become part of the Food Safety Supervisor certification. This includes training in three key focus areas – cleaning and sanitising, safe egg handling and allergen management. The NSW Food Authority also has a requirement for a certificate to be issued in the New South Wales Food Authority format. 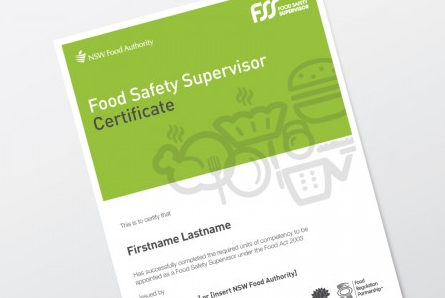 As an approved provider we are supplied with 'blank' certificates which are completed with student details and recorded by the NSW Food Authority). Please note. There is an additional cost of $30.00 (NSW Food Authority fee) payable for the NSW Food Authority certificate. What are my payment options for the course? You may use either Visa or MasterCard through PayPal or Sqid to make payment for any of our courses. Payment solutions are provided by Paypal and Sqid - the most secure ways to make payments over the internet. You will receive emailed copies of your receipt after your purchase. You download your Statement of Attainment from the course site on successful completion. Log in using your original username and password. Scroll to the bottom of the course page and you will see the heading Download your Statement of Attainment. Click on the link to open it and download it. You can then save and print it. Additionally, if you are a NSW resident you be mailed your NSW Food Authority certificate. I have not received the confirmation email for my course. This could be because the email has been flagged as Spam or Junk mail. Have a look at those folders first and see if it has been sent there. If not, send us a support request to be manually confirmed into the course. Once you have achieved 100% for all quizzes and submitted any required practical assessments, please allow up to 2 business days for processing. Your Statement of Attainment will then be available for you to download from the course page. You can access as many copies as you like within the 12 months of your enrolment period. NSW Food Authority Certificates will be posted to you within 2-7 business days of processing your application, following successful completion of the course. Please Note: Any unclaimed certificates that have been returned to us by Australia Post are available to be re-sent to you however a processing fee of $27.50 inc.GST will apply. I haven't logged into my account for a while and now I can't access my course. Don't worry. All you need to do is send us a support request with your name, date of birth, email address, USI number and which course you are enrolled in. We will reactivate your account (providing it has not been more than 12 months since you enrolled) You can then log in and get back to completing your course. I have used up all my quiz attempts. If you are having trouble completing the quiz and need assistance, please send us a request for course support. Before attempting the quiz again, it is best to make sure you are completely comfortable with the presentation. You may view lessons as many times as you need to. On the course page under the heading ‘Navigation’ on the right hand side of the page click ‘Current Course’ then the course code eg. ‘FSA04’ then ‘Participants’ and then click on your name. On the next page click the tab ‘Edit profile’ in the User Details box. Once changes are made, scroll down and click the ‘Update profile’ button. The Statement of Attainment is provided in PDF format. To view it you will need either Adobe Acrobat or Adobe Reader installed on your computer. Adobe Reader is free of charge, click here to proceed to the Adobe website. You also need to check you have completed all components of the course and achieved a grade of 100%. If you are still having trouble downloading the Statement of Attainment you can always send us a support request. How long will my course stay current? Your online course portal will stay active for a period of 12 months. During this time you have unlimited access and support from Food Safety Australia. After 12 months this portal is closed and you will no longer be able to access the course. I have lost my certificate and need a replacement. If it has been more than 12 months since the date of your enrolment there is a fee of $55 inc.GST for re-issuing a Statement of Attainment. Please email info@foodsafety.edu.au or use the Support Centre on our website to request an invoice for this service. Welcome to the Food Safety Australia Support Centre. Here you can access frequently asked questions, read about known issues, and request support if you are still experiencing problems. If you're having problems or need to find the answer to a question please check our Frequently Asked Questions pages before submitting a request to see if we already have an answer for you. We encourage you try to help yourself while trying to provide as much assistance as we can, we provide help resources because usually it's a faster way to get the answer you may be looking for. If you're unable to find the right answers in our support forums you can always ask our support team by submitting a support request.